Neumann’s book is indeed unsettling, but perhaps not about the status quo. The past he reveals seems shockingly familiar. Australian government policy towards asylum seekers and refugees has never been driven by humanitarian concerns but by migration and population policies of successive governments, underpinned for so many years by White Australia. After the war a Labor government, and Immigration Minister Arthur Calwell, was determined to both “populate or perish” and uphold White Australia. The emphasis was not on refugees, but on recruiting migrants from Britain and Ireland. When that recruitment looked like flagging, Calwell looked to blond and blue-eyed displaced persons (DPs) of Latvia, Estonia and Lithuania. In 1945, when Calwell agreed to accept relatives of Jewish families already in Australia, there were stringent conditions. They had to have spent the war years in a labour or concentration camp; had to organise and pay for their own transport and their families in Australia had to guarantee to support them for five years. 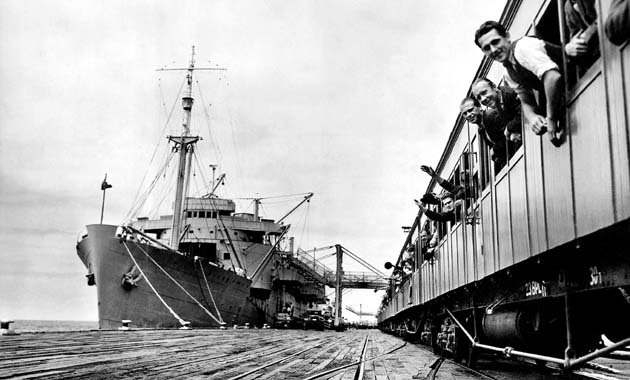 In the face of anti-Semitic criticism about Jewish refugees coming to Australia, rather than stand up to the racism, Calwell ordered that ships coming to Australia were not to have more than 25 per cent of Jewish passengers. In 1972, when Ugandan dictator Idi Amin ordered that all Asians, Indians, Pakistanis and Bangladeshis holding British passports had to leave, the British government appealed to Commonwealth countries to help. The Australian immigration officer in Kampala reported that if Australia’s policy was relaxed, “I consider we could select 1000 good types with useful trade and semi-professional qualifications.” Fifty thousand people fled Uganda, but Australia approved just 190 applications (covering 491 persons) and rejected twice that number. Two thousand others who called the embassy were told not to bother applying. The first boat of Vietnamese asylum seekers arrived in Darwin in April 1976, barely noticed by the press. And future Labor leader, Bob Hawke, was suggesting that Australia should only accept refugees selected offshore; and that Australia had a “right to determine how it will exercise its compassion and how it will increase its population”. Labor went on from its anti-boat arrival stance in 1977 to introduce mandatory detention of boat arrivals in 1992, concerned more about foreign policy considerations of the time than the human rights of Cambodian asylum seekers. The electoral opportunism embraced by Labor in 1977 is now more commonly associated with the Liberal Party and the governments of Howard and Abbott. But beyond the specifics of the 1977 election, the policy responses of the Fraser government laid the basis for many of the pillars that still underpin anti-refugee policy today. In January and February 1977, at a Geneva UNHCR conference convened to try and establish the right to asylum in international law, the Liberal government asserted that Australia, “…will wish to retain its discretion to determine ultimately who can enter Australia and under what conditions newcomers may remain.” Sound familiar? We may never get to the bottom of who actually started the queue jumper portrayal, but as Neumann recognises, it was the start of distinguishing “good” refugees from “bad”. Neumann quotes Whitlam as Labor Opposition leader in 1977 warning the Fraser government not to put refugees “ahead in the queue” i.e. ahead of other migrants sponsored by their relatives. Labor opportunistically positioned itself as advocates for the more established migrant groups (mostly Labor supporters) who supposedly were going to be disadvantaged by the acceptance of boat arrivals. While Neumann seems to lay the blame with Labor for popularising the term (and there is no doubt they used it) there is very good evidence that the Immigration department and the Fraser government were initially responsible for promoting the view that boat arrivals were “queue jumpers”. Historian of the Vietnamese boat people, Nancy Viviani, records that Radio Australia broadcasts to South East Asia in 1978 “spoke sharply about queue jumpers”. More tellingly, it is clear that Fraser’s regional resettlement arrangements were predicated on “stopping the boat arrivals”. Immigration officer Greg Humphries openly admitted being despatched in 1977 to Malaysia, “with virtually my term of reference to stop these boats coming to Australia,” including using sabotage to sink them. Towards the end of 1978, five ships carrying between 1000 and 3000 Vietnamese asylum seekers arrived in various parts of South East Asia. The Fraser government refused to resettle any of them. At the beginning of the book, Neumann says he has selected past historical episodes to achieve a Brechtian “Verfremdungseffekt”—“…an effect that makes the present seem strange.” At the end of the book he also talks about the historical continuity represented in the history. Neumann’s book doesn’t make the present look strange at all—but rather makes the past look hideously familiar. It is precisely the shameful continuity between the episodes that Neumann’s book helps to document. Neumann says, “particular forms of racism can be seen as historically contingent manifestations of a broader anxiety.” At one level, it seems to be anti-Semitism that motivates opposition to Jewish refugees in the 1930s, while it is fears of an Asian invasion that motivates opposition to the arrival of Vietnamese boat people in the 1970s, and Neumann suggests Islamophobia and fear of terrorism that excites opposition to boat arrivals in the 2000s. But opposition to boats is not driven by particular racisms—there is a “broader anxiety” at work, although not the anxiety of the public that Neumann suggests. It is the anxiety of successive governments that is decisive. They have never had a humanitarian concern for asylum seekers; always regarding them as interlopers whether they were Jewish, Asian or Muslim. Like every other capitalist government around the world, Australian governments have a concern to control their border. There is an intrinsic xenophobia, us and against them—and hence the racism—that goes with borders. This can graphically be seen in unseemly European debate over asylum seekers crossing the Mediterranean Sea at the moment, and various governments building fences to keep asylum seekers out. But in Australia’s case, added to the xenophobia is a virulent racism that is a legacy of White Australia and even more widely the politics that goes with Australia’s origins as a settler-state, an outpost of British imperialism in Asia. There is a particularly aggressive nationalism and fear-mongering that goes with that. Neumann’s historical account ends with the 1977 federal election. He argues that the essential elements of the public and government responses to refugees were established by then. Yet there are things that have changed. While cruel anti-refugee policies have been embraced by both Labor and Liberal parties, it is now impossible to imagine a Liberal Party that was not committed to “stopping the boats” and the systematic use of state force that has gone with Operation Sovereign Borders and now the creation of the Australian Border Force. Refugees have become a central element of Australian politics in a way that just wasn’t the case before the Howard government. But perhaps the main thing that has changed, is that since the late 1990s there is now a refugee movement that systematically intervenes in Australian politics to challenge the bi-partisan cruelty. Across the Seas is a useful addition to the movement’s armoury. We need to use it to make a very different kind of history.